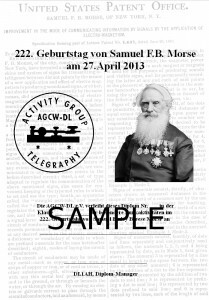 On this occasion AGCW issues a special award for radio amateurs and short wave listeners world wide. There are 3 award classes: gold, silver, and bronze. SILVER – Work/hear 111 members of AGCW and 1 AGCW club station. 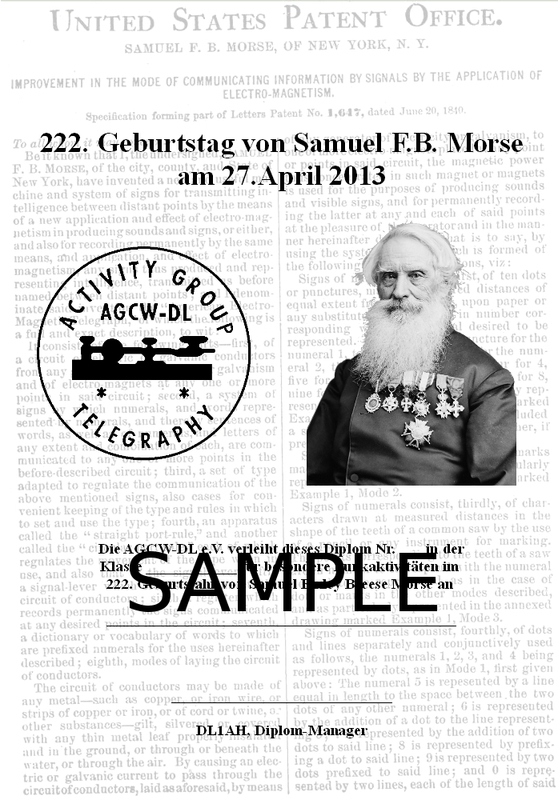 BRONZE – Work/hear at least 22 AGCW member stations and form the string „AGCWDLMORSENFINDICHGUT“ using the LAST character of their call letters. Fee: 5 Euro to be paid via bank transfer, account holder: AGCW-DL e.V. N.B. the transfer has to be done using the the key word Morse2013, your name, and your call sign. List of club stations: DFÃ˜ACW, DLÃ˜CWW, DLÃ˜DA, DLÃ˜AGC, DFÃ˜AGC, DKÃ˜AG.